← Earth Day this weekend! Its been a wet week here in New York and it made going out this past weekend very uninspiring. So Friday night we had Mike’s brother, Anthony and a couple of friends over to hang out and watch a movie. Since we were going to be sitting in front of a television I wanted to make something really easy to serve with the least amount of dishware. 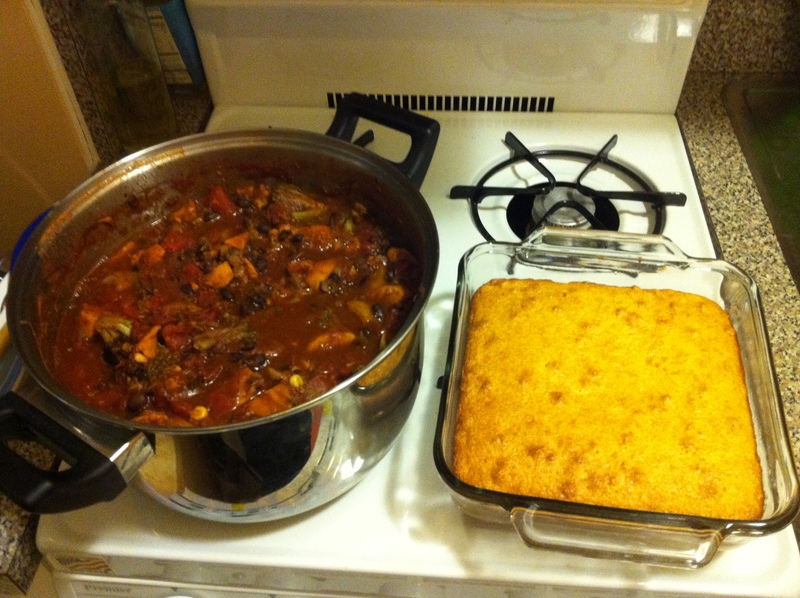 I instantly thought of my go-to veggie chili that I found about a year ago in Food and Wine magazine and some Trader Joe’s cornbread. 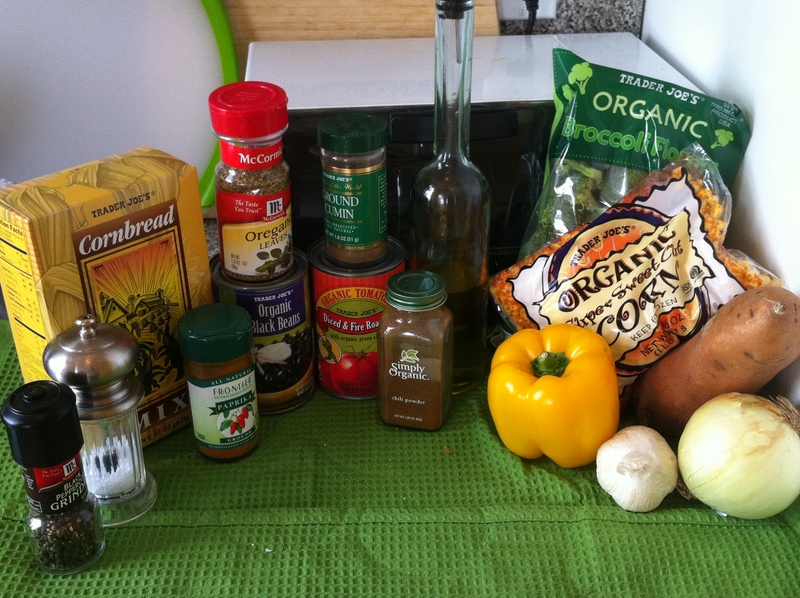 I know, everyone asks how you can do chili without meat? But trust me when I say that this is delicious, hearty and the biggest of meat eaters I know have tried and loved it! 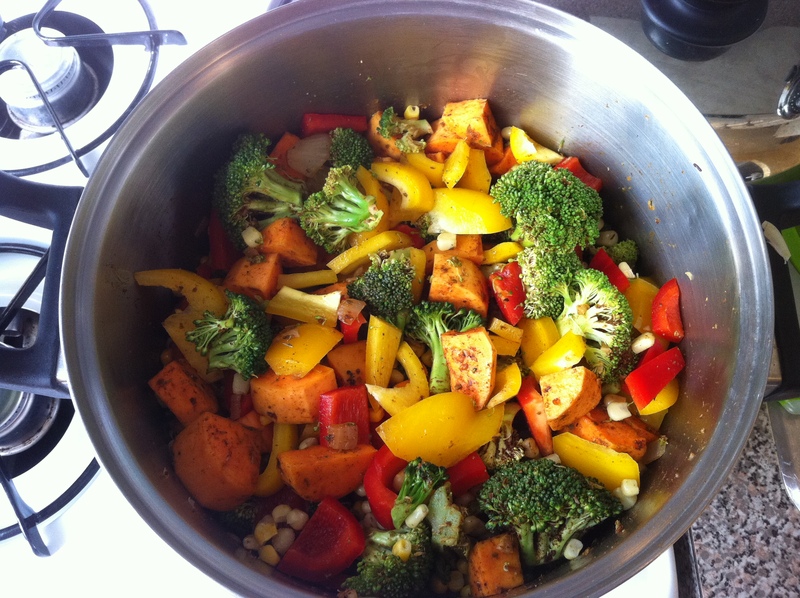 Add the sweet potato, broccoli and spices, then stir until powders evenly coat vegetables. Cover and cook 5 minutes, stirring occasionally. Add tomatoes and black beans. Simmer uncovered for 20-25 minutes. As any chili I think that it tastes better the longer the flavors stew together. So if you have a little more time I’d let it simmer for closer to an hour. This recipe can feed an army! Even with 5 people who all went in for seconds, I still had plenty of leftovers. This made Mike extremely happy because he’ll wrap some in a tortilla for a snack and take it to work for lunch the whole week. 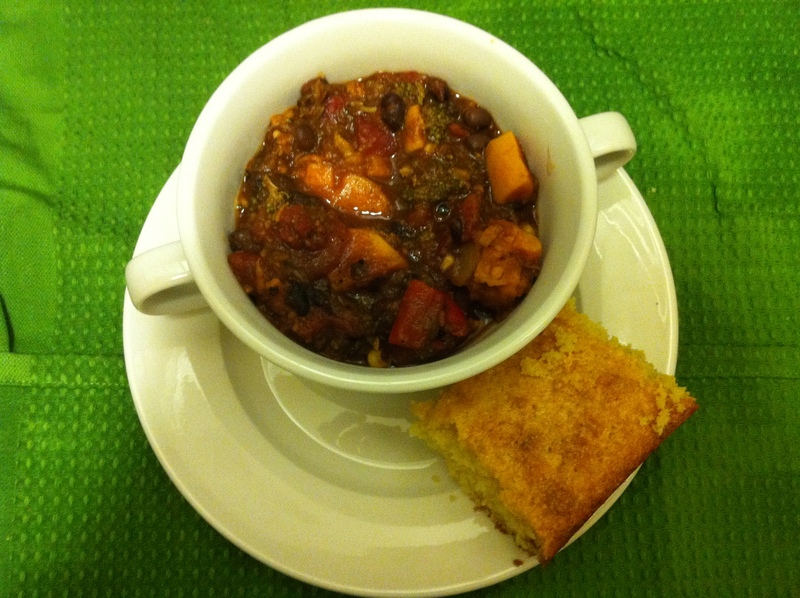 This entry was posted in Recipes and tagged chili, cornbread, food, recipe, vegan, vegetarian. Bookmark the permalink. I’m not a vegetarian, but it’s pretty easy to imagine a chili without meat since it’s so full of beans. This looks really tasty. Do yourself a favor and pay special attention to the bright colors on those veggies before they are cooked. You just can’t stop that. Brocolli? Yes its like a little Chili mop that you can eat! Also like to send a special shoutout to my girl Planet Earth. Happy Earth day tmrw. You need to make this when your home! Bulls Beer and Chili.